Searching for a shirt you like, a book you love or a lipstick of your preference? Have you ever wondered what would you do if you don’t feel like getting out of bed to get them? Save your worries because in such a modern society that we are living today, with only a few clicks you can purchase nearly all kinds of online products that you want. If you don’t know what Google or Bing is, you are clearly living under a very large rock. 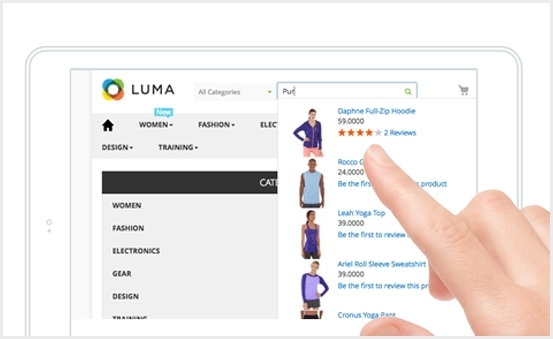 Although some people prefer to use the navigation menu to search for items, others still love using a search tab to find their desired products. 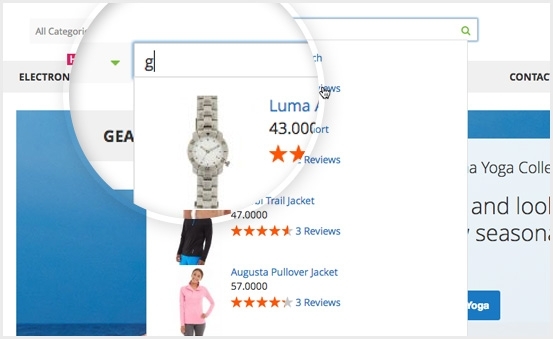 Should you want your customers to have a fast and convenient shopping experience, you should definitely put search tool into your list and add it to your own websites. 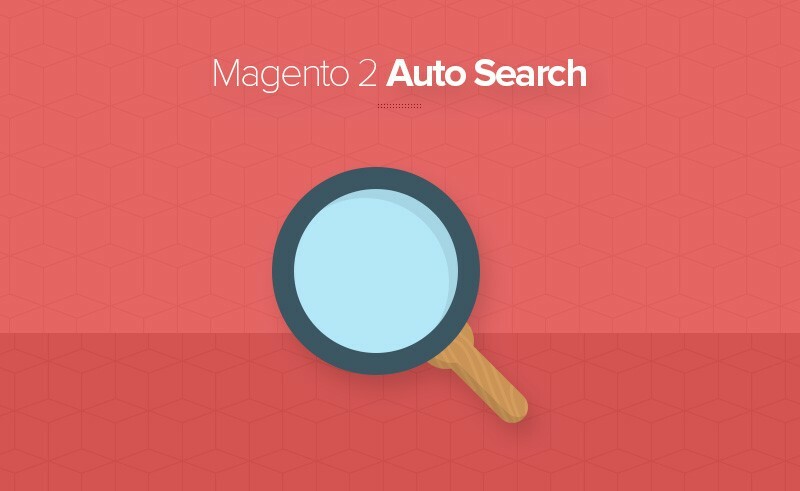 Therefore, if it ever came across your mind how these searching tools came into life and how to exert them, here is our suggestion for you to utilize and experience for yourself our Magento 2 Auto Search. It is assured to engage you and your customers from the very first typed character. This is beyond an amazing art tool which will bring a wonderful shopping experience, enhance your buying process and speed up your conversion rate. 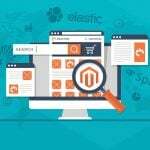 Now, let’s take a look at the reasons why our Magento 2 Auto Search would be your perfect choice! Has it ever bugged you that when typing a few words on those online websites, the key words you wanted just didn’t appear? Then you had to type a complete phrase or a whole sentence to find what you need – what an inconvenience. 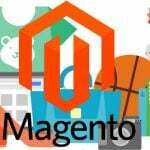 You can rest assured that such troubles will go away when using Magento 2 Auto Search. It will help you look for the exact items you want from the very first typed character appearing on your screen with results of names, descriptions, images and price. It is obvious that no customer likes to wait for the results to come in after a period of time that feels like forever. A very important factor that makes your searching tool stand out from others is its speed. 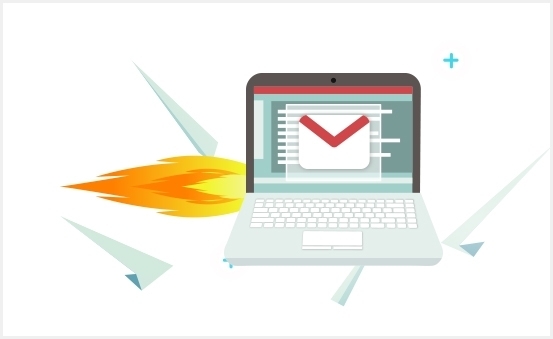 You will definitely gain more satisfied and happy customers with high search speed. 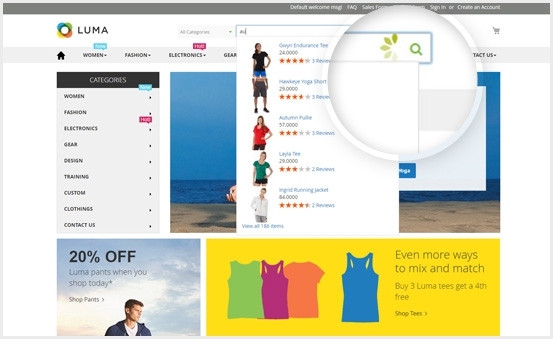 Therefore, you should consider using Magento 2 auto search since the results are delivered in less than a second. There are times when you want to search for an item or product which you cannot remember exactly its name so it often takes you quite some time to spell correctly the needed words or phrases. 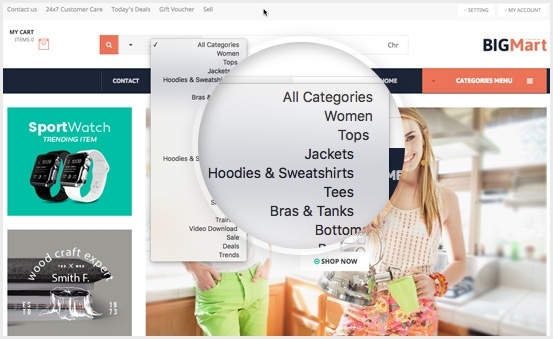 With Magento 2 Auto Search, you will find these phrases so much easier and simpler than you think it would be. The item/product that you desire will effortlessly pop up in front of you. What is the latest fashion trend? Is this item becoming more popular? Those are the questions your customers might ask themselves when browsing your website if they are looking for something trendy. It is very common that they want to be updated on the latest trends worldwide. 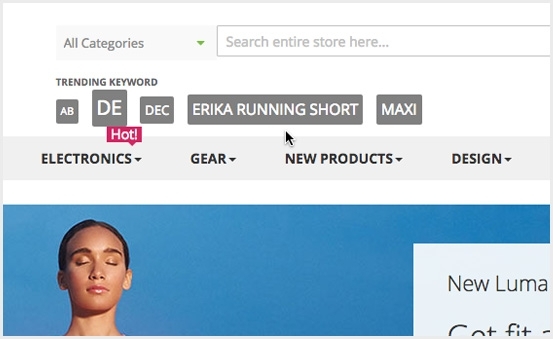 With the help of Magento 2 search extension, you can see all trending keywords based on the number of previous search results of people who visited your store. With an increasing number of smart mobile phones and the raising of internet, there is no doubt that most customers would choose to use their phones to look for products and shop on your websites because it is way more convenient than using laptop or PC. 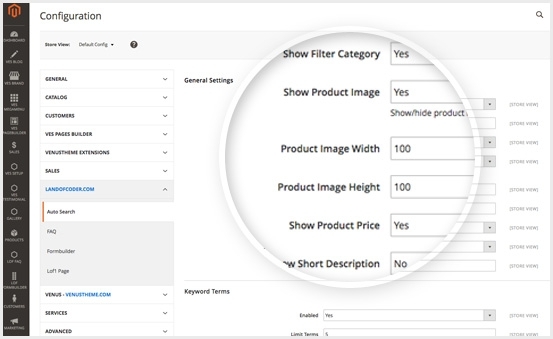 You are only a few clicks away from finding your desired product when using our Magento 2 search autocomplete extension. As an organized and neat person, I always like to categorize things into different groups, and I am sure that many other customers also have the same methods of organizing as I do. Thus, having the choice to put various items into filters is truly important when you look for online products. 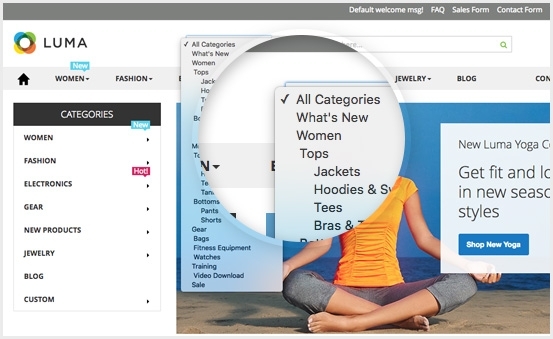 Using Magento 2 Auto Search will allow you to set up filter categories and search based on them. Another vital factor is that the customers have the right to adjust all content elements to form the dropdown template as they wish. 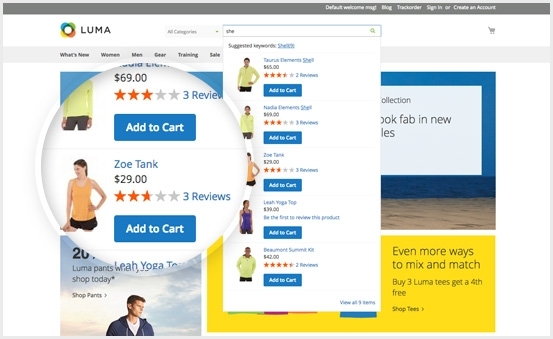 Sometimes the product images or price may be hidden, sometimes they are either too small or too big; All these reasons showcase that the customers should be in control of setting up the number of suggestion in the dropdown box. 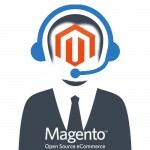 This will not be a problem at all once you use our magento 2 search extension. Once your websites are international, global customers are definitely expected to visit, hence, language setting is very important in encouraging and boosting the experiences of your customers. 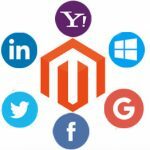 Our magento 2 auto search supports Arabic translation and other right-to-left languages such as Persian, Urdum, Hebrew or Yiddish. No matter where you come from, there shall be no limits to your understanding. It is important for customers to control when and how they want to add some products/items to their “cart” or “basket”. It is nothing different than going shopping in real life, once you want this or that item, you pick it up and “add to cart”. 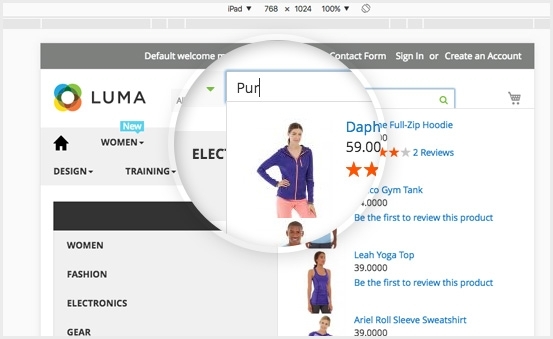 Magento 2 search autocomplete allows you to do just that and even more by showing you other details of a certain product. You must be familiar with the cache memory in your laptop or PC which needed to be erase regularly for your PC to work smoothly. It is the same with online websites. By using cache blocking, Magento 2 auto search helps you to greatly increase the speed of your websites in order to gain more satisfaction from your customers. You can purchase Auto Search at a very reasonable price of $45. The extension package includes free updates, full service, free support and it is guaranteed with 30 day-money-back.